Silicone is made of silicone resin and filled with fillers such as mica powder, asbestos, fiberglass or glass cloth. They have high heat resistance, excellent electrical insulation and arc resistance, as well as water and moisture resistance. Where is the advantage of Rockvee's band? According to the previous paragraph, we can know that due to the material, this band has the advantages of waterproof, sweat-proof and moisture-proof. In addition, with the light material, the holes help to reduce some weight, they improve ventilation and make it a breathable band. If you are a sports enthusiast, this replacement band would be an ideal accessory for your Apple Watch. How to match your clothes? A simple T-shirt, a torn jeans that your grandmother won't understand, and a pair of canvas shoes you've stepped on. Well done! Our bands have a minimum size of 6.1 in (155 mm) and a maximum size of 8.1 in (206 mm), Including the length of the watch. The length is the same whether it is 38 mm or 42 mm, the difference is the size of the watch. ❤Wristband Size: 6.1"-8.1"(155mm-206mm), Including the length of the watch. There is a "38mm" or "42mm" size description on the back of your Apple Watch. Easy to wear with pin-and-tuck closure. 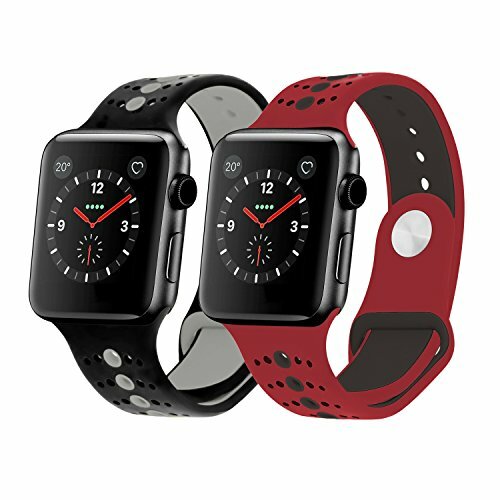 ❤Rockvee Replacement Bands Compatible for Apple Watch Series 1 / 2 / 3, Apple Watch Nike+, Apple Edition. ❤Two-toned bands design with air holes, making the band breathable, portable and adjustable. ❤Different colors for choosing, make a special match with your daily style. The color is exactly same as the image shows and won't fade away. ❤What you get: Compared with the original band, you can save much to purchase our replacement bands for your Apple Watch. You will get the 18 months warranty guaranty, within 24 hours reply and lifetime friendly customer service.